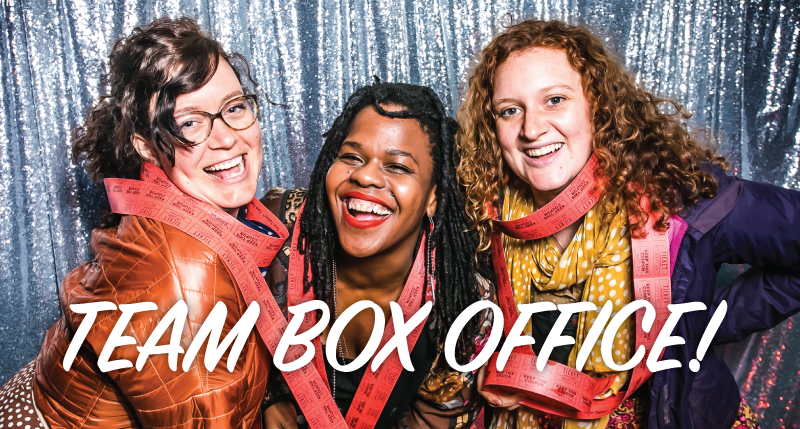 We’re building our Box Office Team and we want you to join us! The Box OFfice Team helps sell tickets at Filmed by Bike. It’s a fun position where you get to see everyone who comes to the movies. The first step in joining the team is to come to our Launch Party and learn the basics of our ticketing program as you sell tickets at this fun event. You like to a fast moving, exciting project that keeps you on your toes. Ability to navigate a really simple but potentially small device. You are extraordinarily friendly! We like to show our guests a really good time. Learn how to sell tickets. You get a MOUNTAIN of rad thank you gifts! A super soft Filmed by Bike t-shirt. A drinking glass with our logo. Filmed by Bike tattoos and stickers. Upon successful completion of your Box Office shift at the festival in May, you will earn a free ticket! This is our Festival Pass launch party – the first day tickets go on sale, and when we open volunteer registration. Tickets are discounted at this event. We will be showcasing our incredible Festival Trailers from over the years, unveiling this year’s Festival Trailer and telling people a little bit about what’s in store for this year’s festival. Volunteers who want to join our team for the Launch Party should also be able to volunteer at the festival May 4-6 for at least one Box Office shift. You may select those shifts later, but we want to know that you have time available that weekend.